Hôtel Kanaï, Vieux Lille, 10 rue de Béthune (03.20.57.14.78/www.hotelkanai.com). €. In a building that was revamped just two years ago, the Hôtel Kanaï offers a sleek design experience at bargain prices, featuring a polished concrete hallway, modern art, neat mosaic bathrooms and plummy shades. There's airconditioning but no lift. Hôtel Brueghel, Vieux Lille, 5 parvis St-Maurice (03.20.06.06.69/www.hotel-brueghel.com). €€. The quirkily eccentric Brueghel has soul, from its cheerful downstairs clutter of pot plants, knick-knacks and squashy sofas to the charmingly antiquated lift. The smallish bedrooms are freshly painted in pretty colour schemes and have attractive wrought-iron lamps, though the streetside ones overlooking Eglise St-Maurice can be noisy at night. Hôtel des Tours, Vieux Lille, 27 rue des Tours (03.59.57.47.00/www.hotel-des-tours.com). €€. On a quiet side street off restaurant-packed rue de Gand, the Hôtel des Tours integrates an old brick façade on one side with a modern extension on the other. Although the reception spells '80s business modern, staff are helpful and rooms are pleasant, decked out in warm colours, with white tiled bathrooms. The high-ceilinged mezzanine duplexes sleeping up to four are ideal for families. There's a downstairs bar and outdoor tables in a small courtyard. Alliance Lille Couvent des Minimes, Vieux Lille 17 quai de Wault (03.20.30.46.08/www.alliance-lille.com). €€€. Located a little out of the centre on a peaceful quayside towards the Citadelle, the centrepiece of this listed 17th century monastery is its stunning rib-vaulted red brick cloister, its courtyard now glazed over as a slightly glitzy bar and restaurant. The traditionally furnished bedrooms are a little tired-looking in comparison, though most cleverly open off galleries above the cloister. 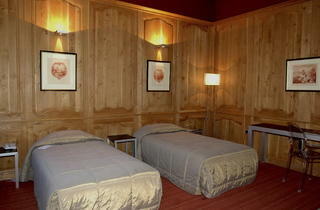 Hermitage Gantois, République & Wazemmes, 224 rue de Paris (03.20.85.30.30/www.hotelhermitagegantois.com). €€€€. Lille's most luxurious lodgings occupy a gorgeous Flemish charity hospice founded in 1460 by merchant Jean de Gambe for the old and decrepit. It was still in use until the 1990s, before being cleverly converted. The hotel's charm lies in its series of garden courtyards, and the clever mix of historic features and sophisticated modern design in the bedrooms, where oak panelling and exposed beams meet steel desks and Philippe Starck chairs. There are two restaurants, one gastronomic, the other the inexpensive Estaminet Gantois specialising in regional fare.